Haddon Hall is a fortified medieval manor house dating from the 12 th Century, and is the home of Lord and Lady Edward Manners whose family have owned it since 1567. Described by Simon Jenkins in 1000 Best houses as "the most perfect house to survive from the middle ages", this remarkable old house is surrounded by terraced Elizabethan gardens and is set amongst the rolling countryside of the Peak District National Park. The house is open to visitors from April to October, with a number of special events being staged throughout the season. School parties and groups are very welcome. Haddon has featured in many films and TV programmes including Pride and Prejudice starring Keira Knightly, Mathew MacFadeyn, and Dame Judy Dench. 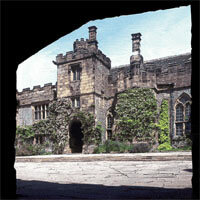 Most recently Haddon was used as the setting for Thornfield in the BBC's adaptation of Jane Eyre.